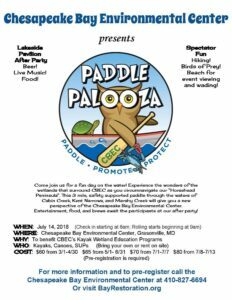 Support Wetland Education Programs and Paddle CBEC’S Peninsula at PADDLEPALOOZA on JULY 14TH 2018! Experience the wonders of the wetlands that surround the Chesapeake Bay Environmental Center in Grasonville, MD during this unique opportunity to circumnavigate the “Horsehead Peninsula”. This 3 mile, safety supported paddle will give you a new perspective of CBEC as you paddle through waters of Cabin Creek, Kent Narrows and Marshy Creek, while offering a celebration of your aquatic Chesapeake adventure at CBEC’s Lakeside Pavilion following the paddle. LIVE MUSIC, Food and Beer Trucks await the participants at a lively after party at our Lakeside Pavilion including family activities and various vendors! Registered participants will receive a bottomless cup of beer and snacks. Food will be available for purchase from food trucks on site. 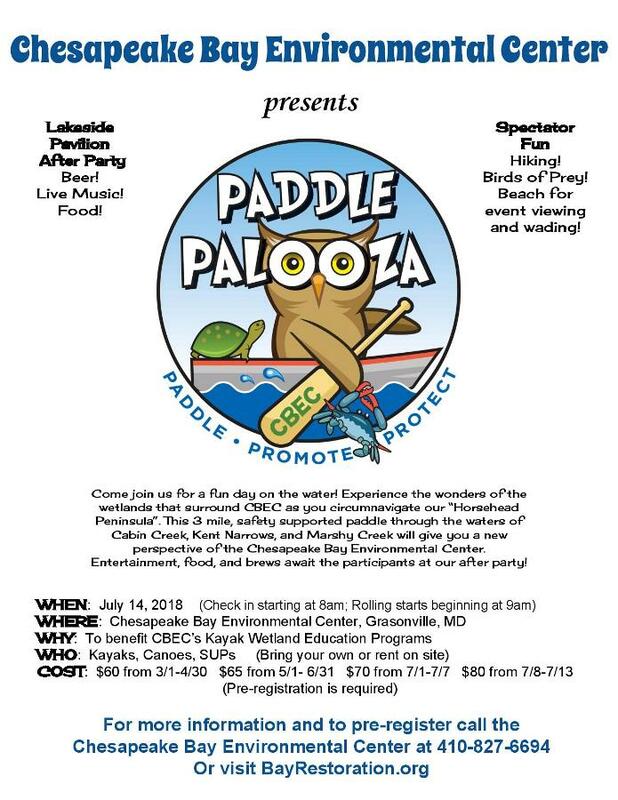 To register for the event visit CBEC’s website form: https://www.bayrestoration.org/paddlepalooza/. All proceeds benefit CBEC’s Environmental Education Kayaking Programs!